Tati's film personas - Francois the Postman in Jour de fete and the popular Monsieur Hulot in Les Vacances de Monsieur Hulot, Mon Oncle, Playtime, and Traffic - helped reveal the inherent humor of humanity attempting to exist in an increasingly mechanized society and drew positive comparisons to the silent film comedians Charlie Chaplin, Buster Keaton, and Harold Lloyd. As co-writer, star, and director of these films, he sought to depict the foibles of society as it became more dependent upon as well as more confused by technology. While hugely successful with popular filmgoers, these films are also recognized by film critics for Tati's revolutionary method of conveying humor through overlapping audio effects and mise-en-scenes in which several comedic acts occur at once, which sometimes required more than one viewing to witness every action. Several subsequent directors, most notably Robert Altman, have employed this style successfully for their own films. While Tati only produced five films in a career spanning more twenty-five years, he is admired for developing a brand of humor that ennobles humanity while poking gentle fun at it, conveying that humor in a way that entertains and challenges audiences and advancing the film-comedy genre. Critic Dave Kehr, in his review of Les Vacances de Monsieur Hulot, asserted that, without the films of Tati, "There would be no Jean-Luc Godard, no Jean-Marie Straub, no Marguerite Duras—no modern cinema. With his 1953 film, Jacques Tati drove the first decisive wedge between cinema and classical narration." In these films, the only recognizable actor is Tati as either Francois or Hulot, in order to keep audiences from focusing on the celebrity onscreen and concentrated on the situations and actions. Tati also composed his scenes to include several activities at the same time, which he captured with one stable camera that captured everything. He rarely employed close-ups or reaction shots, believing that audiences did not need such devices to find the scene's humor. Tati's father was an art framer and restorer who was disappointed that his son did not enter the family business. After attending the Lycee de St.-Germain-en-Laye, Tati was a rugby player for the Racing Club de Paris from 1925 to 1930. In the 1930s, he worked as a pantomimist and impressionist and toured European music halls and circuses. Much of his act consisted of pantomimes of famous athletes of the era. Several of these routines were filmed, including Oscar, champion de tennis and On demande une brute in 1934 and 1935. In 1939, Tati enlisted in the French Army. Following World War I, he was a supporting actor in two films by Claude Autant-Lara, Sylvie et le fantome and Le Diable au corps. In 1947, he made the short film L'Ecole des facteurs, which he expanded into the 1949 feature film Jour de fete, a comedy film in which Tati portrays the French postman Francois. Francois becomes obsessed with attempts to make his post office operations more efficient after observing an American postal training film. Tati employs this premise to lampoon the impersonality of technology. While much of the film's humor is physical, Tati consciously avoids slapstick by staging much of the action behind objects placed in the camera's foreground, forcing audiences to imagine the full thrust of the gags they are visually denied. Jour de fete is, for many critics, similar thematically to Chaplin's Modern Times; both directors seem to believe that civilized humanity is lost in the rushing onslaught of its own technology. Following the release of Jour de fete, Tati spent four years making the internationally successful Les Vacances de Monsieur Hulot (Mr. Hulot's Holiday), which introduces the character he portrays in all his subsequent films. Hulot is a tall, thin pipe-smoking man, who is presented as an objective, innocent observer of the pratfalls of the characters he encounters. Hulot is as much a straight man as a source of humor. The English-language version of Les Vacances de Monsieur Hulot begins with a warning: "Don't look for a plot, for a holiday is meant purely for fun." The film does not feature a plot in the traditional sense of a novel or short story, but presents recurring themes, episodes, and characters that bear more of a resemblance to poetic structure. The film is also noted for Tati's use of wide-angle cinematic framing, in which a motionless camera captures the action without following the actors or cutting to close ups that emphasize the jokes and actors' reactions. In 1958, Tati released Mon Oncle, a sequel to Les Vacances de Monsieur Hulot. In this film, Monsieur Hulot receives much less screen time as the uncle who conspires with his nephew to thwart the encroaching modernism of household appliances. Tati's first color film was also an international success, despite the fact that he had relegated Monsieur Hulot to a supporting character. During the 1950s, Tati was approached by American television with an offer to produce a series of fifteen-minute short films featuring Monsieur Hulot, which he turned down. Increasingly annoyed by audiences' association of Tati with his creation Monsieur Hulot, Tati only employed the character briefly in his next film, Playtime. The film took Tati more than nine years to film, largely because he insisted on constructing large, elaborate, futuristic sets that were both expensive and time consuming. An epic film, originally clocking in more than two-and-a-half hours, Playtime was shot using seventy millimeter film and stereophonic sound for enhanced visuals and audio. In order to finance the film, Tati sold the rights to his previous films and eventually went bankrupt when the film failed at the box office upon its release in 1967. He tried to recoup his loss by shortening the film by more than forty-five minutes; it was shortened again to ninety-three minutes upon its release as a thirty-five-minute monaural film in the United States. Reducing the length and width of the film, however, rendered much of the visual humor unintelligible. The film revolves around Monsieur Hulot's attempt to arrive at a job interview in a modernistic city that is confusing and impersonal. In Playtime Tati once again refused to allow the camera to isolate the humor. Instead he used long shots to create what Kehr called: "Long-shot tableaux that leave the viewer free to wander through the frame, picking up the gags that may be occurring in the foreground, the background, or off to one side. The film returns an innocence of vision to the spectator; no value judgments or hierarchies of interest have been made for us. We are given a clear field, left to respond freely to an environment that has not been polluted with prejudices." While the film was unpopular with film audiences, other directors borrowed freely from Tati's style, including Robert Altman, who used a similar style in his film, M*A*S*H.
While some critics believe Tati's last theatrical film Traffic, released in 1971, marked a creative retreat by Tati in order to recover the financial losses of Playtime, others compliment the film as an inspired revisiting of Monsieur Hulot's battle against technology. Tati abandoned the futuristic settings of Playtime for a more contemporary setting of Monsieur Hulot's automobile and the roadways he travels on his way to the Paris Auto Show. The films, however, bear thematic resemblances in their handling of modern progress and human isolation. While Playtime is set in an ultramodern city constructed of glass, steel, and concrete behind which humans lose contact with one another, Traffic is set inside the cars of the individual characters who also have cut themselves off inadvertently from each other. The more relaxed visual style of Traffic marked a return to the style of Tati's earlier films. His last film, Parade, is a one-hour film made for Swiss television. Tati died in 1982 of a pulmonary embolism in Paris. 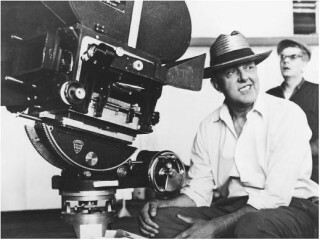 View the full website biography of Jacques Tati.